Lovemore Kambudzi, an honourary graduate of Zimbabwe's famous BAT Studios of Fine of Art of the National Gallery of Zimbabwe in the 1990's has emerged to be one of the most successful painters since independence in 1980. The reserved soft spoken artist who rarely appears at public gatherings has never been hesitant to speak out his mind through his work even on issues that are sometimes considered to be extremely sensitive by mighty forces. Lovemore's successful satirical way of panting on massive canvases, intricacies of each and every subject with the usage of unforgiving timid brush strokes and the controlled use of colour strongly makes his work an instant hit in most parts of the world it has been exposed to. ... Recently Kambudzi's piece titled "Last Warning" from Czech's Marie Imbrova's collection was pledged to Art for Africa™ Auction, a unique auction that presented the work of cutting-edge African artists alongside some of the major names in American Contemporary art at Sotheby’s New York on November 17, 2011. 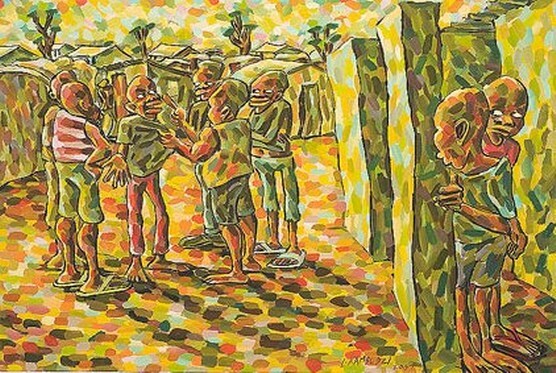 This second Art for Africa™ Auction followed the successful inaugural one held in London in September, 2009. The proceeds from the New York sale will benefit Africa Foundation’s work in support of orphaned and vulnerable children living in some of the poorest rural communities in South and Eastern Africa. Zimbabwean acclaimed contemporary fine artist Lovemore Kambudzi has joined some of the world-renowned artists to fund-raise for Art for Africa Foundation with his masterpiece titled "Last Warning". The piece will be among other paintings to be auctioned at Sotheby's New York beginning on November 12 to 17, 2011. The Chitungwiza-born Kambudzi is a well-known passionate perfectionist when it comes to fine art and his unique style of paintings shows his uninhibited skill with oil paint and brush. ... Africa Foundation (USA) will host a Gala Dinner to launch the auction catalogue on 12th October that will also feature highlights of the Art for Africa™ New York collection. The entire collection will be exhibited at Sotheby’s New York from 12th -17th November. 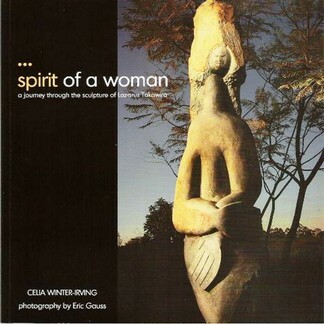 Název článku: LAZARUS TAKAWIRA'S LIFE AND WORK IN "SPIRIT OF A WOMAN"
"Spirit of a Woman: A journey through the sculpture of Lazarus Takawira" is one of the most authoritative books on one of Zimbabwe's and Africa's finest sculptors, Lazarus Takawira. The book, by author Celia Winter, is about this magnificent Zimbabwean sculptor, his life, work and origins. ...This 46 page book is a story of the work of Takawira, accompanied by stunning images of his work by photographer Eric Gauss. Published in 2008, with special support from Marie Imbrova and the Alliance Francais, "Spirit of a Woman: A journey through the sculpture of Lazarus Takawira" is a tribute to a master. Název článku: FOOD AND TRAVEL: IT’S A FAMILY AFFAIR … AT DA EROS! SADLY, my family is 10 000km away, still braving the British cold which descended on them (just before I did!) in mid-November.